The global hybrid cloud market was valued at USD 40.62 billion in 2017, and is expected to reach a value of USD 138.63 billion by 2023, at a CAGR of 22.70%, during the forecast period (2018 - 2023). The scope of the report is segmented, by Type, which includes Solutions and Services, by Delivery Models, which include Infrastructure as a Service (IaaS), Platform as a Service (PaaS), and Software as a Service (SaaS). The end-user industries are limited to government & public sector, healthcare, banking, finance, services, and insurance (BFSI), retail, information and telecommunication technology, media and entertainment. While the region considered in the scope of the report include North America, Europe, Asia pacific, Middle East & Africa, and Latin America. 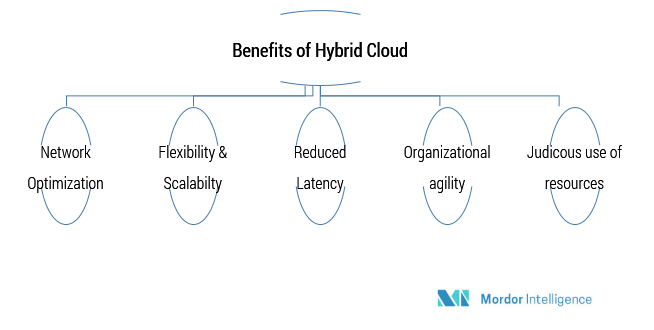 Some of the major drivers for the growth of hybrid cloud market are - growing emphasis on agile and scalable computing processes, high level of benefits offered by hybrid cloud, and growing volumes of business data. The emergence of hybrid IT services (for which hybrid cloud are a key enabler) coupled with increased emphasis on analytics are expected to open up new growth opportunities during the forecast period. However, concerns over integration and operational aspects of hybrid cloud and security issues remain the major challenges affecting market growth. The major benefits of IaaS offering include scalability, no hardware capital expenditure, utility style costing, location independence, and physical security if data center location, no single point of failure. The user is able to provision the processing, storage, networks, and certain fundamental computing resources, where the consumer can deploy and run arbitrary software (operating systems and application). The consumers neither manage nor control the cloud infrastructure. However, they will have control over the operating systems, storage, as well as deployed applications and limited control of selected networking components. The hybridization of cloud is imperative among the IT decision makers, who prefer hybrid solutions rather than relying on one or the other. Almost 50% of major European and North American enterprises are utilizing the services of IaaS. The level of interest for IaaS among those who deal with controlling software usage is on the higher side compared to that of those who deal with hardware. The hybrid IaaS is expected to continue to grow during the forecast period and it is expected that majority of the enterprises in the developed economies will implement hybrid IaaS in some form in their operations. The higher competition among cloud-based service providers in the region of North America is pushing the companies to deliver security of data, while ensuring quick access and higher reachability. This is a primary driver of the hybrid cloud market in the region, especially in the case of public centric services. While local private clouds facilitates fast local access to large files, control over sensitive data and compliance with certain regulatory and audit agreements, the increasing consumer base in North America is pushing even the big organizations to employ public clouds to reach the geographically dispersed consumers, thus, boosting the hybrid cloud market in the region.